A solution like K2 blackpearl can help make the challenge of rebuilding your business applications more manageable. Its visual, easy-to-use tools help ensure that you are not dependent on consultants or even your IT department to build apps. The reusability of K2 SmartObjects also means that you can leverage the apps that you have already built to create new apps faster; it also makes updating apps to meet changing business requirements easy. 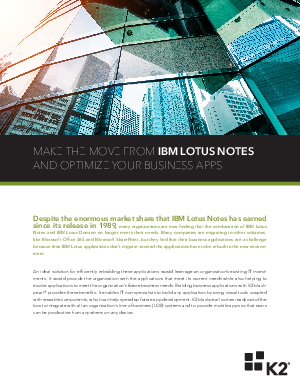 Ultimately, using K2 to quickly and efficiently rebuild apps from your previous IBM Lotus Notes and IBM Lotus Domino environment means that your workforce can focus on the business rather than processes.